Big Stone Ridge forms the border of Virginia and McDowell County west of Bluefield, West Virginia. 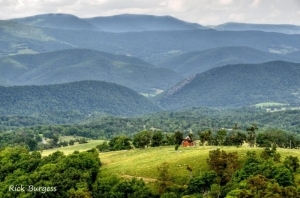 The ridge marks the southern extent of the Allegheny Mountains and is an outlier of Great Flat Top Mountain. The Tug Fork River rises along its western flank. Anawalt, West Virginia, and the Anawalt Lake Wildlife Management Area are located at the foot of its westward slope.